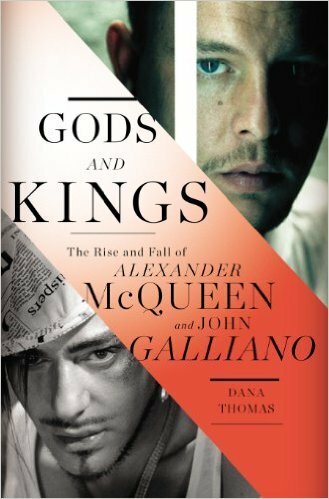 Even if you don't follow the world of high fashion, Dana Thomas' dual biography of British designers John Galliano and Alexander McQueen is one of the nonfiction titles of the year. Thomas probes the torrential world of haute couture as she chronicles the lives of fashion superstars whose meteoric careers read like a modern Faustian tale of tragic dimension. Thomas opens the book with the infamous spectacle of John Galliano's 2011 downfall, that was caught on tape and made international headlines. The drunk and viscous Galliano was seen hurling anti-Semitic and misogynist epithets against Geraldine Bloch, (curator at the Paris' Institute of the Arab World) who was dining at a nearby table with her boyfriend on the terrace of the Paris cafe La Perle. Under French law, Galliano was arrested and charged with a hate crime and the tape went viral on the internet. At the time Galliano was head designer at Dior, then part of a design conglomerate headed by financier Bernard Arnault. Galliano was initially just suspended from the company, but when previous similar incidents resurfaced in the tabloids, he was fired. Galliano's flameout was a year after Alexander McQueen committed suicide at the height of his own success. McQueen's manic nature, drug use and pressures of the industry all co-factors in his spiral down. McQueen was from a proud working class Londoner family with proud Scottish heritage. Galliano family moved from Gibraltar to England when John was six, but his mother kept Spanish-Moroccan culture alive in their London home, which became part of this design DNA. Both men identified as gay at a young age and were bullied in school and both developed combative personalities to activate when necessary. They became more driven in their careers. Both designers were considered vanguards that spoke to their generation early in their design careers and their shows were like rockstar events. Thomas structures the book, theatrically, around their important collections and shows that defined their careers. Galliano created theatrical spectacles to showcase his collections, which were sensations in the industry, even his designs had little ready-to-manufacture and wear potential. McQueen was considered more of a master craftsman from his Seville Row training and refined in Milan. At 23, McQueen designed a 'new silhouette' for both sexes with his 'bumster' line. He also devised such high concept, often politically editorial shows that it alienated buyers even as it dazzled the art and even pop culture world. Their stories merge when John is hired to at Givenchy in Paris, to rebuild the house with fashion forward ideas while maintaining its elegant standard with more youthful and affordable ready-to-wear collections. Even with dicey receptions to his runway shows, Galliano was so successful rebranding the company that Arnault moved him to the couture Olympus as head of Dior and lured McQueen to become head of Givenchy. McQueen was more of a hands-on artisan, often in the production rooms sewing next to the ateliers. Galliano was more of a theatrical wizard with an inspired eye who delegating designer who appropriated high fashion artistry from past eras and re-envisioning. Both were spinning out new collections, sometimes maniacally and often with their egos on overdrive with brilliance and self-medications. Thomas brings the magic and mayhem of this world vividly alive on the page. Her detailing about design craft and the way she critiques the fashion shows is top drawer fashion writing. McQueen was producing work that met the artistic expectation that were also translating into sales and across the board media attention. The all-powerful Anna Wintour, who previously was appalled by McQueen's personality and viewed his talent with skepticism, now was not only in the front row of his shows also wearing his couture. Meanwhile, after Galliano staged his biggest fiasco aptly titled The Train Wreck, the most expensive Dior show ever, in its wake, rumors were floated that McQueen would be replacing him at Dior. The fashion luminaries of the era - Vivien Westwood, Versace, Saint Laurent, and Lagerfeld - move in and out of the story. Rising stars like Tom Ford, who was revitalizing Gucci, are in the wings adding to the industry intrigue. Thomas chronicles the pressure nonstop shows and endless cycle of creating new collections, at the insistence of the corporate bosses. Galliano was becoming increasingly furtive and eccentric. At one point he was brought into Arnault's office for an intervention and ripping his shirt open and saying "does this look like the body of a drug addict?" He was also becoming more unreachable after the sudden death of his industry confidant and otherwise unpopular personal assistant Steven Robinson. McQueen was also spiraling downward with heavy drug use and going AWOL before shows, often with his latest lover, since his two main relationships had already become casualties to the demands on him. McQueen was shaken too when his confidant, fashion editor Isabella Blow also committed suicide. Dana Thomas could have relied on so much surface reportage and still had a great book. True to fashion 'Gods and Kings' has unavoidable episodes of industry hubris, not to mention, drug and club benders, toxic models and cameos of the titans of the field ( Just to hear about Nuclear Wintour, for instance, is gossip gold.) Admirably, Thomas never leans on the backstage drama to carry the book. And No matter how dramatic, scandalous or titillating Dana Thomas reports and illuminates with a steady hand, journalistic skill and craft that is finely cut for this or any other season.